With about six minutes left in the fourth quarter of their game Wednesday against the Denver Nuggets, the Toronto Raptors found themselves trailing by 1 point. Coming off a possession that started with an offensive rebound, the Raptors pulled the basketball out and ran a pick-and-roll between Jose Calderon and Andrea Bargnani. It worked so well that they went back to it, then they went back to it again. In total, the Raptors used Bargnani as the roll man in the pick-and-roll three times during a two-minute stretch, scoring seven points off of it (good for a PPP of 2.33), and turning a 1-point deficit into a four-point lead. What’s really interesting about these pick-and-rolls is that they not only got into them three different ways, but Bargnani scored out of them three different ways, showing off his versatility when put in pick-and-rolls. In this standard high pick-and-roll, you have Bargnani setting up at the top of the key by the 3-point line, setting a ball screen for Jose Calderon. Calderon does a good job of setting up the screen, coming off Bargnani, and using it effectively. In terms of setting ball screens, versatility means the ability to do different things when the point guard comes off your screen. As a shooting 7-footer, Bargnani can either pop out or roll to the rim, and while he favors popping out, doing so close to 79 percent of the time, his size makes him a threat when rolling to the rim as well. 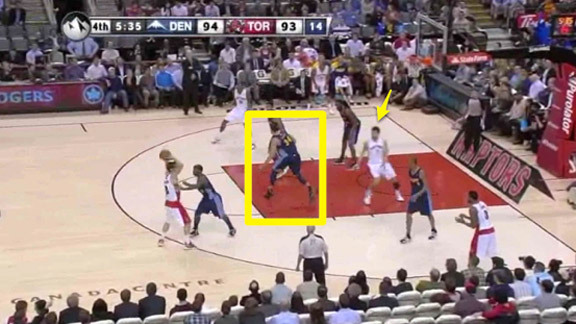 So in this case, when JaVale McGee leaves him to hedge on this ball screen, Bargnani dives into the paint. 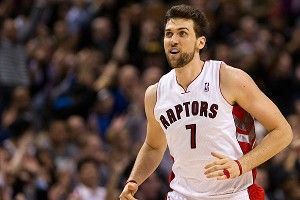 Because of Bargnani’s tendency to pop out more than he rolls to the rim, that’s what the defense is expecting him to do. 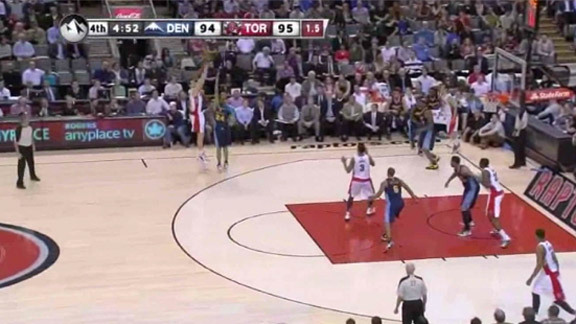 After hedging, JaVale McGee shoots to the foul line, expecting Bargnani to be in that area, but he’s not there. 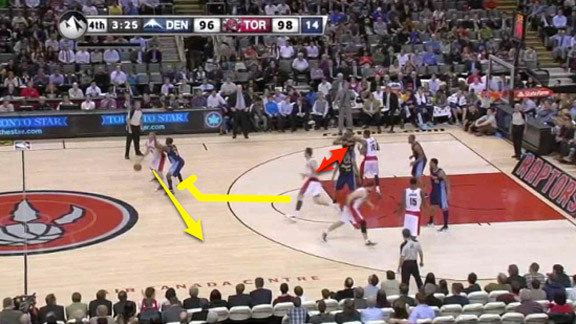 Instead, Bargnani is in the middle of the paint, wide open. Jose Calderon does a good job of finding Bargnani, who makes the catch, turns around, and shoots a jumper in the short corner. JaVale McGee hustles to get back in front of Bargnani, but he was so lost that he doesn’t have to get a hand up and contest Bargnani’s shot. 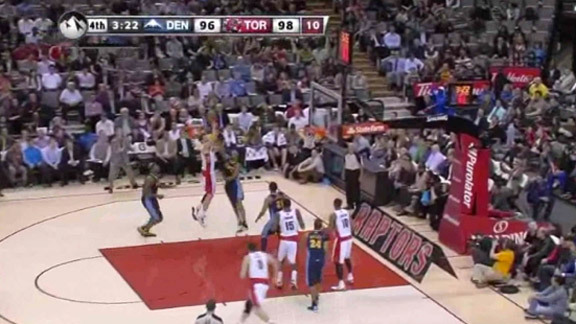 Bargnani knocks it down easily. 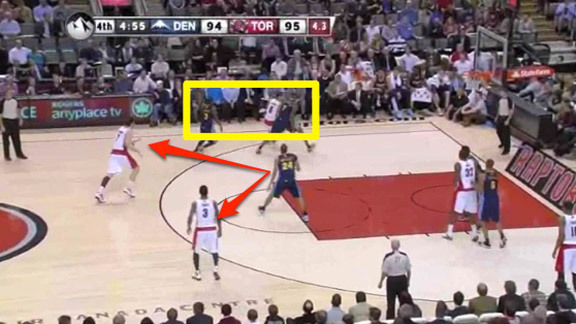 On this possession, the Raptors want to post Bargnani up, as he is being defended by the much smaller Al Harrington. Harrington does a pretty fantastic job of pushing Bargnani off the block, and the result is Bargnani turning and facing up near the 3-point line. After a failed post-up attempt, one that turned into a busted isolation attempt, which featured Bargnani jab stepping for about six seconds, Bargnani kicked the ball out to Jose Calderon with six seconds left on the shot clock. After making the pass to Calderon, Bargnani understands the situation and follows his pass, looking to set a ball screen and create a scoring opportunity out of a poor possession. As Calderon comes off the screen, he is looking to turn the corner and get to the front of the rim. This forces Al Harrington, who is hedging on the screen, to stay with Calderon longer than he likes. Meanwhile, after rolling to the rim on the first pick-and-roll, Bargnani pops out this time, ending up out near the 3-point line. This puts Andre Miller in a really tough position. He’s responsible for his man, Gary Forbes, but he also should be ready to leave him and close out on Bargnani in case he makes the catch. To do that, Miller splits the difference right at the 3-point line. Calderon hits Bargnani out on the wing, who makes the catch and fires over the outstretched arms of Andre Miller, who is simply too short to be able to bother Bargnani’s shot. After knocking down a jumper from the short corner in the previous possession, Bargnani drills a 3-point shot as the shot clock winds down. If you want to get into a high ball screen early in the shot clock, but fear that having your big walk up and set the screen will allow the defense to be prepared for the screen and get in position to defend it, you can run action before the actual ball screen, forcing the defense to pay attention to that action and then try to defend the ball screen. Here, Calderon brings the basketball down the court as Bargnani is on the block. With Calderon now dribbling the ball at the top of the key, Bargnani walks his man into the middle of the paint and then shoots out to the top of the key, coming off a pin-down screen. 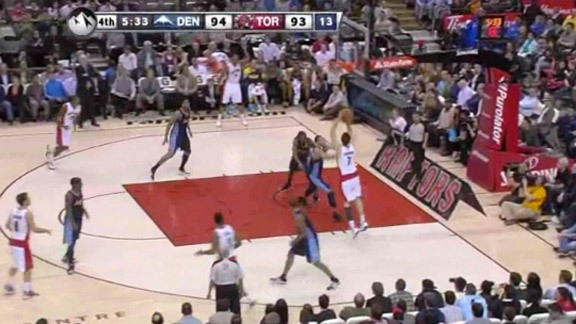 Bargnani has no intention of coming off this pin-down screen looking to get open for his shot. 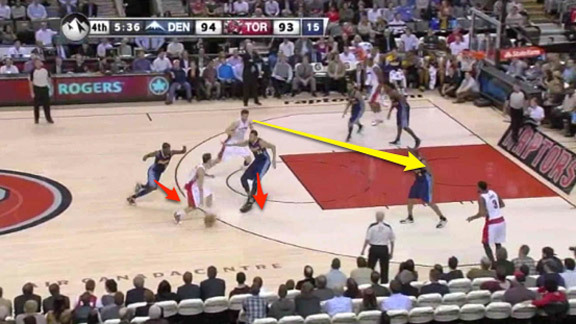 Instead, he runs right off it and gets in position to set a ball screen for Calderon. 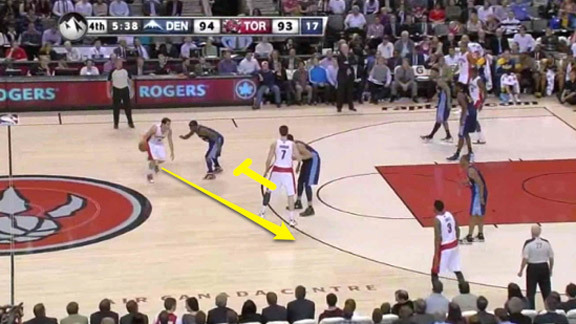 If Bargnani was just running into a ball screen, what was the purpose of the pin-down screen for him? Well, it gets the defense moving. In this particular instance, that pin-down screen results in a lot of space between Bargnani, and his man, Al Harrington. 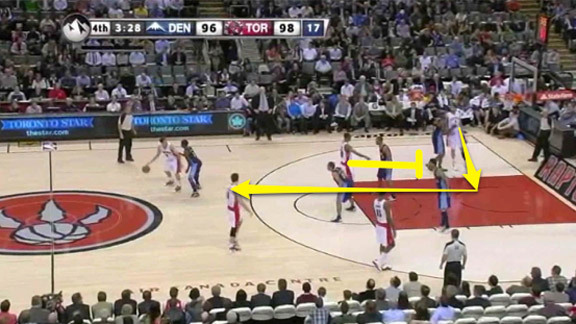 This space is important, especially considering Denver’s strategy with the last pick-and-roll situation was to hedge. With Harrington giving Bargnani way too much space on the wrong side, he now has to overcompensate, essentially sprinting to get in position to hedge on Calderon. 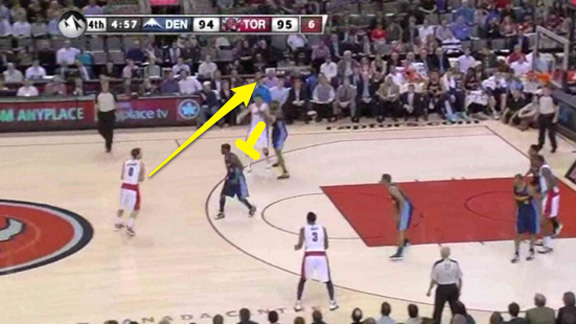 That, combined with the fact that the remaining three defenders on the Nuggets are paying attention to the rest of the Raptors’ thinking there is more action, means there is a whole lot of space for Bargnani to work with as he pops out and Calderon makes the pass to him. 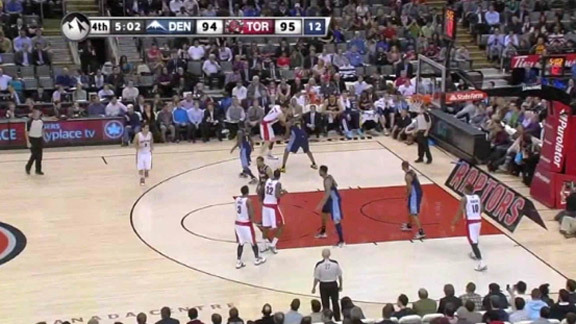 Bargnani makes the catch, dribbles into that space, and attempts a floater. He misses the shot, but because the defense had to range over from a long way away, they can’t contest Bargnani’s floater without fouling him, sending Bargnani to the free throw line for two freebies that he knocks down. During these three possessions, Andrea Bargnani’s versatility is apparent. After rolling to the rim and getting an open jump shot in the short corner, on the next possession he pops out, stretching the defense and allowing him to knock down a 3-point shot over a point guard closing out on him. Finally, he makes the catch out by the 3-point line, drives into the paint, and draws a foul. What these three possessions also show is that you don’t have to just get into pick-and-rolls; they are effective when you do that, but they can also be effective with the shot clock running down, and when you run sets to get into those pick-and-rolls. 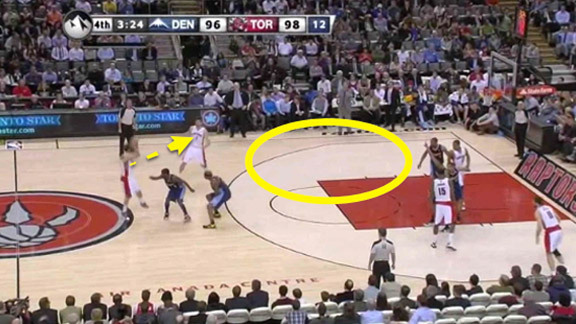 Something the Toronto Raptors did really well late in their game last night.